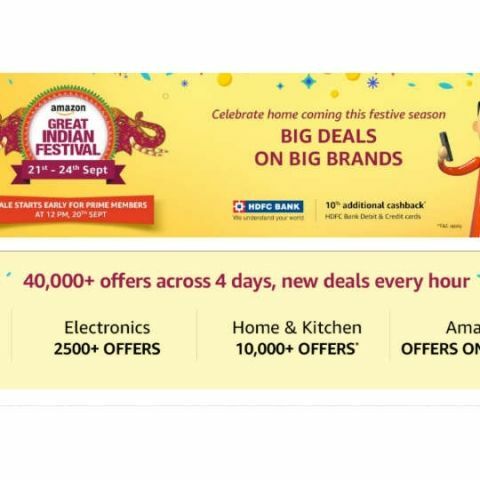 Amazon is all set for its Great Indian Festival sale which will kick off on September 21 and last until September 24. Amazon is offering its Prime members an early access to the sale at 12PM on September 20. The ecommerce portal is offering a slew of discounts across various categories such as Mobile phones, laptops, PC accessories and more. Here’s a preview of the upcoming sale. Consumers will be able to avail up to 40 percent discount on smartphones. Smartphones across brands such as OnePlus, iPhone, Xiaomi, Lenovo, LG, Samsung and more will see price cuts in the sale. Mobile accessories such as cases, covers, and storage devices will also be offered on discounts between 50 to 65 percent. Moving on to laptops, Sony, Dell, HP, and others will get a price cut of up to 20 percent. Headphones and speakers from Sony, JBL and many more will be up for grabs at slashed rates of up to 60 percent. Amazon’s sale will be offering up to 40 percent off on Television prices and Amazon’s Fire TV stick will also be available at a discount. The e-commerce platform’s own products aka Amazon basics will also get a 60 percent discount. PC accessories category will get discounts of up to 60 percent. Gaming consoles will sport a price cut of minimum Rs 1,700. Users can avail up to 10 percent additional cashback using HDFC debit and credit cards. Consumers can also expect to avail some discount using their Amazon Pay balance while shopping. Some exclusive offers such as Golden Hour Deals will only be available via the Amazon app during the sale. Amazon is also offering no cost EMI and exchange offers across its various products on sale.